Find out what our experts have to say about Royal Enfield Thunderbird 500! The Thunderbird 500 is for them who want to munch miles at a faster pace than its 350cc sibling. The 500cc motor understandably offers better performance and the dollops of torque means riding on mountain roads is easier. The large tank capacity also means less fuel stops despite its not so frugal nature. The Thunderbird 500 is the perfect touring bike from Royal Enfield’s portfolio. The least priced variant is Royal Enfield Thunderbird 500 STD priced at Rs. 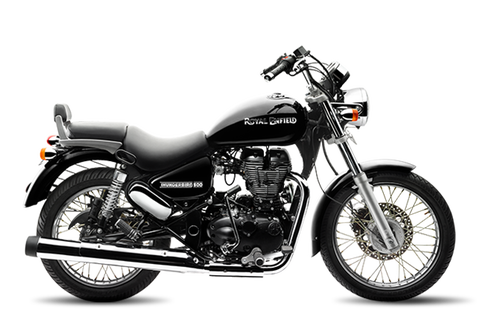 2,34,247 and the most priced variant is Royal Enfield Thunderbird 500 ABS priced at Rs. 2,41,679. Choose the Royal Enfield Thunderbird 500 which fits the bill of you. The Royal Enfield Thunderbird has been one of the most viable cruiser options in the market in its price bracket, since its inception in the Indian market. The limited presence of competitors, a superb option in a very niche segment and the 'Royal Enfield' tag has earned a huge fan following and large sales volumes for Royal Enfield. It is this model which changed the perceptions of people towards Royal Enfield and began to consider them as a modern player. The Thunderbird 500 is the latest guise of this sub-brand and is an advancement over the 350cc version. Let's start with the styling. The Thunderbird 500 continues to carry the same silhoutte of its younger sibling, the 350, as before, which is not a bad thing at all, considering the older one was a delight to look for. Where the Royal Enfield has played with are the various bits and components, which enhance its modern appeal. For instance, the headlamp now incorporates a projector headlamp with an LED ring surrounding it. The round chrome finished mirrors make out the way for larger blackened mirrors. The round tail lamp has been replaced by a small elliptical LED tail light which looks nice. The other components which are new as well are the meatier exhaust pipe, present generation switchgear and an all new instrument console, which is a two pod unit and is the most informative unit found in a Royal Enfield ever. The left pod showcases an analog speedometer and the right one displays an analog tachometer, incorporating a small rectangular LCD display showing fuel gauge, odometer and trip meter. Overall fit and finish has improved drastically over previous Thunderbird, but still has a small room for improvement even now. The engine, more or less, is the same unit found in Classic 500, which is able to make out 27.6 PS of power and 41.3 Nm of torque. The Thunderbird has always been renowned as a torque monster, and this one taking the legacy even further. The engine has the same characteristic exhaust note as any other Royal Enfield, though sounds much more refined than earlier, and seems smooth in lower rev range , where the torque is present in abundance and is the Thunderbird's forte. It's only at around the redline where it begins to give its breath and be out of its comfort zone. The five speed gearbox is a clunky unit, but the ratios exploit the availability of torque very well. Being a cruiser, the Thunderbird 500's top most priority is to be an able handler and comfortable machine, and it delivers on this aspect by a huge margin. The upraised handlebar and forward set foot pegs give it a typical cruiser feel, and a cushy seat rounds off a comfortable seating position. The suspension setup of front telescopic forks and rear gas charged coil springs work just the way you want to, and even on long stretches, it proves to be a non-tiring mile muncher. The brakes are all new units with discs at both ends, and though a bit rubbery, work much better than the old drum units. Unlike the earlier skinny tyres, the new ones are much meatier and provide good levels of grip. That said, the Thunderbird 500 is a step above its 350cc sibling with a bigger heart and enormous amount of torque on tap, and given the Royal Enfield branding, it can be easily bought without any second thought, given the amount of heritage it carries behind. It is a perfect tool for weekend rides and long highway touring, as no motorcycle comes close to it, for the time being.